I'm still skeptical. Only one title from DC Comics' New 52 is out and I only plan on reading four titles (<i>Justice League</i>, <i>Action Comics</i>, <i>Superman</i> and <i>Mister Terrific</i>) but the first issue of <i>Justice League</i> really impressed me. 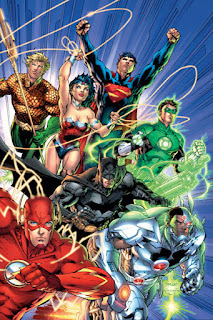 Despite the cover featuring seven heroes, only four make an appearance in the book and only two are actually focused on. The story takes place "Five Years Ago" where superheroes are apparently hated and feared. Batman is being hunted by the Gotham City Police Department when Green Lantern shows up. Batman and GL escape the GCPD and find a creature apparently in cahoots with Darkseid who attempts to blow them up. Feeling this is all alien-related, Batman and GL decide to approach an alien in Metropolis, Superman. When they arrive, Superman is not at all a welcoming host, knocking out Green Lantern and threatening Batman. Then the book is "To be continued..."
I really liked the first issue and it left me really wishing <i>JL</i> was a weekly series because I want to read #2. While I am still not sure if DC relaunching everything is a good idea, it seems to be off to a good start. I am eagerly waiting for <i>Action Comics</i> and <i>Superman</i> to be released because I've heard good things about <i>Action</i>. Time will tell if this relaunch was a good idea. People will jump on board with the first issues but how many will still be around for the tenth issue, the twenty-fifth, the eighty-fourth? How many of these 52 titles will reach their tenth, twenty-fifth or eighty-fourth issues?